The typical street scene of Great Junction Street is that of high tenement flats with shops. Leith Local History society set up a Research Group and chose Great Junction Street as the subject of our first historical research project. The street that was to become Great Junction Street first appeared on maps in the early 19th century as ‘proposed new street’. It was intended to link Leith’s first wet docks with both Ferry Road and Leith Walk and to enable dock traffic to ‘bypass’ the narrow streets of old Leith. It remained a proposal for many a long year. Junction Bridge was eventually built in 1818 but it was not until the late 1830s that the road between the bridge and Bonnington Road was surfaced so that traffic from the docks could reach Leith Walk. 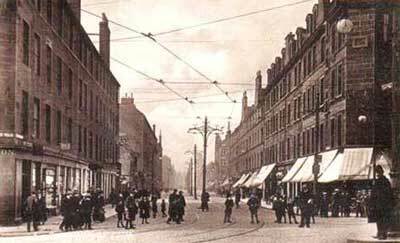 In the early days there were very few buildings in Great Junction Street apart from a cluster that the Leith Walk end. One of the first buildings to go up was Junction Road Church which was built in 1824/25. In 1839 Dr Bell’s School was built. Apart from these buildings, Great Junction Street was mainly occupied by timber merchants, builders and other who needed a lot of space for their businesses. Gradually the street began to fill up until in the 1890s the entire frontage was built up. Some of the buildings have long since gone or been replaced. For instance from 1850 until 1907, the South Leith Poorhouse stood on the site now occupied by Taylor Gardens. Next to it was Hawthorn’s Engineering works - established in 1846 on the site later occupied by the State Cinema. Another long forgotten building was St James’ Episcopal School which stood on a site later occupied by Leith Provident Cooperative Society's Telectra House. This in turn has recently been replaced by flats. Leith Local History Society’s research project has unearthed a great deal of information. It reveals a fascinating mixture of residential, commercial and industrial occupation along with churches, schools and other public buildings. We would still like more information about the people who lived and worked there. If you have any information (or photographs) which might help with this project, please contact the Society by posting a message on the inquiries page and a member of the research team will contact you. More recently we have been given an old scrap book of newspaper cutting about Edinburgh Dynamos Ladies Football team which was formed in 1946. We are presently doing some research to see what more we can find out about this team and the ladies who played in it. If you have any information about the team we would welcome details. We do not undertake commissioned research projects but if you have a question about Leith we might know the answer or be able to put you in touch with someone who does. Please feel free to contact us if you have any questions about the history of Leith.